This species has no common name. The spider itself is very small (body length of females about 1.75 mm) and requires sustained searching to locate. It is very variable in colour and pattern and frequents the underside of leaves of shrubs and the lower branches of trees. Stiff leaves seem to be preferred, for example, oak, holly and sycamore. 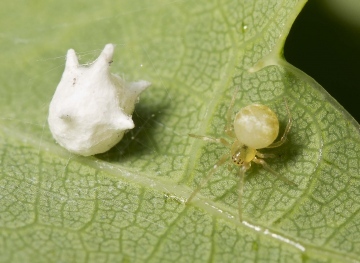 It is not the spider itself that is so recognizable, however, but its bizarre egg sac. This is pure white, often larger than the female herself (2 mm or so) and with pronounced projections. 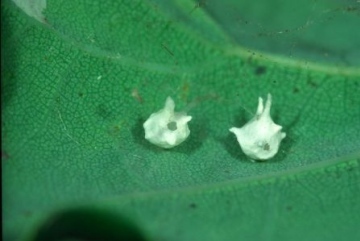 No other spider egg sac resembles it. From late July onwards an increasing number of egg sacs will have a single hole in their side, from which the young have emerged.